Tea and healthy snacks are my thing! This is the first time I’ve heard of reading socks!! Yeah, reading socks are sold in a lot of Canadian bookstores. I don’t know how many people regularly use them, though. Great list! You can’t go wrong with a pair of fluffy socks, and I bet colouring while listening to an audiobook is really satisfying – I’ll have to give that a try. It’s very satisfying, indeed. I hope you like it. This is such an interesting topic — I love listening to audibooks, but usually when I am at the gym or out for a walk, so in a way I am distracting myself when I am listening to them. Interesting take! I’d never thought about using audiobooks at the gym. That’s a good idea! And thanks. I’m not a listener of audiobooks either. Maybe it’s the pacing but more than likely, it’s the fact that I use time when I COULD listen to them to listen to music instead. However, the things you’ve listed would help me if I decided to do so. Hey, you should show some of your coloring. I’m super interested! Audiobooks are tricky – you want to entertain yourself while listening, but it’s so easy to lose focus. I usually knit something simple (so that I don’t have to keep count of the stitches) or play Tetris while listening to audiobooks. Yes, exactly. I love your suggestions and thought you did a wonderful job with your post this week. Glad to hear it. I hope you do blog about them! I like all of these things! I do listen to audiobooks but mostly while I’m driving or doing chores. Those seem like very good times to listen to audiobooks. I always clean while I listen to audiobooks, it keeps my hands busy! Ooo those reading socks look comfy, I have a couple of pairs of thick socks and I can confirm they make the experience a lot more enjoyable. And I’m glad you love your thick socks! I would DEFINITELY need distractions. I find something that works for me is cleaning the house while listening to an Audiobook in my wireless headphones. It’s just the right balance of mindlessness and business that I do pretty well. Driving doesn’t work for me. I think coloring might though! Great post! I love this advice. Thank you. Great idea. I listen whilst driving or walking, doing the dishes or cooking and just sitting. Thanks. Cooking seems like it would be a wonderful time to listen to audiobooks. I think it would be interesting to try it while walking, too. Ha, glad to see I’m not the only one who had to fiddle with the prompt because I don’t read audiobooks. xD That’s so interesting to hear about your grandmother using her tea bag twice! I was always told I was weird when I do that, so I’m glad to hear there are others like me. I have ADHD, so I have trouble focusing on audiobooks most times, but your idea to color while listening to one is golden! I might give it a try. I might actually be able to make it through a book if I did that. My hands need to be busy when I’m listening to something, or otherwise, I completely zone out. I hope colouring works nicely for you. Audiobooks are a great way for me to get through my commute or other travel. (I can’t look down to physically read while I’m a passenger in a car, so it’s good for long trips, too.) I also listen while knitting, or sometimes while doing chores like folding laundry that require both hands but not much brainpower. That makes a lot of sense. How long have you been knitting? Very cool list!! I recommend starting out with a novella or maybe even a favorite story of yours. That may help ease you into it!! TY so much for stopping by my blog <3 I loveeeee your list!!! Best of luck!!! You’re quite welcome. I’ll definitely start off with something short then. I’m really happy for you. That’s awesome. I’m generally reluctant to try audiobooks, too, but some narrators make it worthwhile (Wil Wheaton) to try a new story in audible format, and others (Paul Scofield, Jim Dale) make beloved stores like Narnia and Harry Potter a new experience. Cool. I’ll keep them in mind. I listen to a lot of audiobooks. I bet I would like to color while listening, too. Thanks for visiting my blog. The only way I could get through my own books on audiobook without feeling totally self-conscious was to color while I listened! I loved doing it that way and will occasionally color still while I listen to a book. Glad to hear that. Colouring is so relaxing. Tea is essential for any format of books. I like to listen to audiobooks while I’m out or while I’m knitting. Thanks. Heh, you totally should. And hello to a fellow Torontonian! Great take on the theme! I read at a normal pace, so I don’t think audio books would be all that good for me either. Thank you. I’m glad you know where you stand on the audiobook question, too. Tea and healthy snacks are a great idea. As is the coloring. Maybe that would help me focus on the story more. I find if I do other things like clean etc. the way everyone else seems to listen as they go about their day, I get too wrapped up in the task I’m doing and miss things. And I agree the pacing can be a bit slower. I have a friend that listens to them on 2x speed, but I find that too fast. I think I upped Good Omens when I listed to it last year to 1.25x speed to cut down on the pauses between words and sentences, but I still found my mind wondering too much. Yeah, I have the same problem with listening to stuff while cleaning, etc. It’s hard to focus on what you’re doing and what you’re listening to sometimes. Heh, I hear you there. Tea is awesome, though. I was a bit leery of audiobooks until a few years ago when I listened to the Harry Potter audiobooks for the first time – I still prefer print books but I usually have an audiobook on the go. I love how listening to an audiobook frees my hands up to do something else – usually a craft or sewing or something like that. 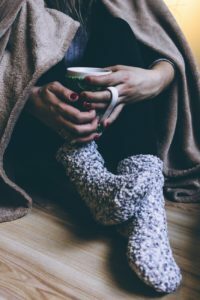 Your list definitely makes me want to do more cozy things – love the idea of the reading socks! Thank you. Crafting while listening to an audiobook is a great idea. I’m not an audiobook person either. Not even in the car on long drives, my mind wanders too much. I’ll suddenly realize that I’ve spaced out and missed a whole chapter. Thanks for stopping by my blog earlier. You’re quite welcome. It sounds like we’re pretty similar on this issue. Like you, I cannot seem to get into audio books either. It takes away from the imagination. But I think your tips, if I were to try it, seem great. I LOVE to sip tea and adult color while listening to a good podcast. I didn’t know reading socks were a thing but now I am intrigued and want to know more. Are they like house-slipper socks? I’d say that reading socks have a similar texture to house-slipper socks. They are very thick and warm and could almost be used as shoes if they had rubber soles instead of being soft all over. I hope that makes sense. It’s hard to describe these things! I’m right there with you in not be an audiobook reader! I feel the same that I can read a book faster than it can be read to me. And I never realized the thing about the voices, but I feel like that’s true for me! You did better than I did on staying on topic today! I went completely off the wall! Lol. The colouring is a great idea! I need to have something to do when i’m listening to an audiobook, I can’t just sit and listen. Only if I’m cooking or tidying or in the car. Thank you. So glad you think so. I love this idea! I agree with all of these and even have my own pair of reading socks. But ADULT COLORING BOOKS ARE THE BEEEEEEST!! They’re so relaxing! They sure are! So glad you’ve discovered the joy of them as well. I actually do crafts while listening if I need some decompression time because I always have to be doing something with my hands. There’s no way I could make it through otherwise. Good job. 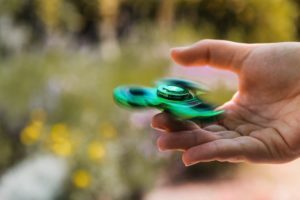 I once took a fidget spinner away from a [grown up] friend in church–it was making me fidget! lol. That’s a good tip! Thanks. I love the idea of pairing a coloring book with an audio book. I might try this in the future! I have only listened to a few audiobooks, but I usually find that going for a relaxing walk really helps. If I am just sitting there listening, I find my mind can wander – even if it’s an interesting one. I do rather like it for short breaks at work though. Colouring is an awesome idea! That would definitely work for me! I’m glad to hear that. Happy colouring! Going for a walk is another great idea. Coloring while listening, what a great idea!! I’m always doing something while I listen to an audiobook – folding laundry, taking a walk, cleaning the house. I find it difficult to just sit and listen. Coloring and playing games on my phone sometimes work too! If you find audibooks too slow, try digital audiobooks from your library. You can speed up books up to 2x faster which can be helpful. I’ll try that. Thanks for the tip. I love your spin on this week’s topic. I also love the idea of listening to audiobooks while coloring. That just sounds super relaxing. Thank you very much. Yes, colouring while listening to audiobooks would be quite relaxing, I think. You’re welcome. And I hear you there! Just like you, I’m not much into audiobooks. I don’t know what the deal with socks but they do help me get into reading mode. Thank you very much. I’ll have to try an audiobook at 1.5 or 2x speed sometime. These are great! I’ve never been an audiobook person but my (newfound) love of podcasts makes me believe I could enjoy them (though not as much as a good book). I do think I’d need to be somewhat occupied since I clean or do errands while I listen to the podcasts. Hot tea and a coloring book sound like the perfect, cozy remedy. I love the idea of coloring while listening to audiobooks. I listen to audiobooks while cleaning my room and at night when I don’t feel particularly sleepy. Oh, that’s a great idea! And thanks. … I do not own reading socks… when I first heard about them as a thing, it hadn’t really occurred to me that I might need specialised socks for the endeavour… but they do look super comfortable! Heh, for sure. Thanks for stopping by. I can only listen to audiobooks when I’m doing something, like driving or cleaning. I keep thinking that one day I’ll try cross stitching while listening and see if that works. Otherwise, I find it too slow an experience; like you, I’m a fast reader. That makes sense. It must be a nice distraction. Ooooo. Doing a colouring book while listening to audio sounds so relaxing! I’m going to have to try that! That’s an excellent point. Ha! I always need to be doing something else while listening to audiobooks. I mostly listen when I’m driving, doing work around the house, making art, or when I’m working on something that does not require much attention (such as typing or playing a game). I like your list. All of these sound like relaxing ways to listen to an audiobook. That makes total sense. And thanks. Perfect. Now that would be a reading experience. Perfect. Now that would be a great reading experience. Though I might avoid the socks…it’s warm already here in Houston. Heh, you definitely wouldn’t need cozy reading socks in Texas. Interesting post! Colouring in while listening to an audiobook sounds like a great idea! Coloring while reading sounds like the perfect duo! I love that you include reading socks! And adult coloring books. I love those! Heh, thank you. I’m glad you appreciated them. I’ve never heard of reading socks but I have a rather large collection of warm fuzzy socks. My feet are always cold despite living much farther south than Canada! Audio books took me awhile to get used to and to enjoy. My first were rereads or middle grade books and I’ve really enjoyed some memoirs read by the author. They make folding laundry or cleaning tasks so much easier and the few times I’ve colored while listening were so relaxing. I really need to do that more often. I love the story about your grandmother! You asked if I had seen the Netflix adaptation of Guernsey. I haven’t yet! I keep meaning to watch it but always forget about it when I actually can. Plus, I’m a little afraid because I so loved the book. I’ve only seen the first 20 minutes or so of Guernsey and hadn’t read the book beforehand. I do like the storytelling, though! Thanks for sharing these! I love audiobooks myself, because I can read at work, on road trips, and sometimes while doing chores around the house. 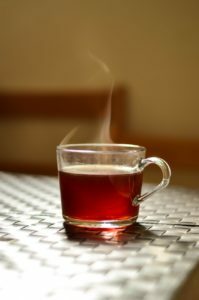 I’m not a huge tea person, but I enjoy it sometimes. Thanks. Do you like coffee? I’ve found that a lot of people tend to prefer one or the other with those two drinks. I haven’t thought of using coloring books with audiobooks, but that’s a great idea! I also sometimes have trouble with slow audiobook pacing—that’s why I love it when audiobook apps let you listen at double speed, etc. I use Libby to listen to audiobooks from my library and there are a bunch of speed options. I’m so glad that speeding up the pacing is an option. 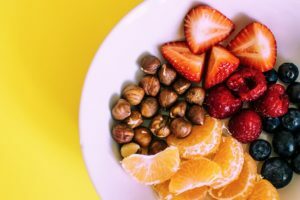 It’s not something I knew when I wrote this post. How often do you use Libby? Those are excellent reasons to listen to audiobooks! And as many have pointed out by now I’m sure, speeding the pace is such a plus. Thank you, and I was so glad to learn that. Heh, I hear you there. And it’s nice to meet another fan of colouring books. I love my thick fluffy reading socks. In fact, I switch out of my normal socks into thick fluffy socks whenever I get home for the day so that I can curl up and feel cosy, lol. I’ve tried the listening while colouring and it works amazingly well! I’m so glad that’s an option. I have a friend who always colors when she listens to audios and she loves it and finds it so relaxing. Great list! Thank you. Your friend sounds like a nice person. I always have trouble listening to audiobooks. I get so easily distracted and then all of a sudden I miss 3 chapters! I have never been an audio book fan, but I have listened to one or two. Maybe someday I’ll give another one a try, and just lately I’ve been wondering if I’d like classic lit better in audio book format. Might be worth a try. You’re quite welcome. Classic lit might be better in audiobook form! I love audio books! But I can’t listen to them in 1x speed anymore. Usually 1.4x to 1.8x depending on the narrator’s voice lol. I also listen to audio books when I’m assembling Gunpla, robot toys that come in pieces then you click them on together. It takes me about 4 hours to properly assemble a good one. And Gunpla sound so cool. I wonder if they have them here in Canada? For sure they do! I have Canadian friends who are also builders. They’re usually found at hobby shops or Japanese anime shops, if you have them in your area. Coloring is perfect while listening to audiobooks! If I am not reading along with the audiobook I’m probably coloring or playing a puzzle game on my phone. Also, tea is perfect for reading of any kind. It’s the best comforting drink to have in order to get cozy and read. Ooh, a puzzle game is a good idea. I’ll have to try that.